Antiques challenge. Auctioneers Anita Manning and Philip Serrell continue their trip in their classic Fiat 500, heading to auction in Driffield in the East Riding of Yorkshire. -GAVEL BANGS There will be worthy winners and valiant losers. Phil, the beginning of our next buy leg. -Are you not raring to go? -I've got some catching up to do, haven't I? -You completely drilled me yesterday. Anita won the first leg and is prepared to fight to keep her lead. -You've got to be careful when Phil Serrell's about. But our Philip can find a use for anything. That would make a fantastic bog roll holder. That's what we have at home. Try to keep your eye on the road, Phil! Our experts both began their trip with £200. Anita took the early lead, giving her £242.43 to spend today. and Scotland, before finishing up in Crooklands, Cumbria. and ends at auction in Driffield in the East Riding of Yorkshire. -I love this part of the world. the Yorkshire Dales, I think it's absolutely glorious. I really do. Is there a plan today then? -Tell me about your tactics. You think you're going to beat me? takes its name from the 12th century castle around which the town grew. It's also an antiques shopping Mecca. Now, Phil, I don't want you following me around. Mission Hall is located in the heart of the town's antiques district. Dale Robson is the man to meet. -I'm Anita. And this is Philip Serrell. -You've got some good things in here, haven't you? -Have a good wander round. -We'll have a good wander around. -Right, we'll see you in a bit. -I'm going to the sparkly cabinet. And Phil is quick to spot something. was made about 50 yards from my office in Worcester. This is all Worcester porcelain. And this is all by the Stinton family. They all painted at the Worcester porcelain factory, in various guises. The worst thing is, it's all out of my price range. But it is really, really lovely. Anita is having a little more luck with one of the other cabinets. I rather like this little inkwell and pen tray. It's in the Art Nouveau style. Decorated and embossed with flowers. I love items which have to do with writing. It takes you back to a time when people wrote letters. And I love the Art Nouveau period. So I'm going to have a closer look at that. -It is made of...some sort of base metal, I would imagine. Britannia metal. I think it would be something for a lady's writing desk. -Oh, it is very pretty, yes. but I like to see something which has a maker's name on it. -Yes, it is nice to see. -Puts it in a certain place. There's 26 on it. Which I think is not too bad. -You might not need a discount. -I might not need a discount. Could it be bought sort of somewhere between 15 and 18? -I could do it for 20. -You could do it for 20? I'm going to go for that. I like it. Thank you very much. -You haven't been suckered in already, have you? -Succumbed to the Manning charm. Have you found anything big and crazy yet? He's on to something, though, look. -Dale, I've just seen these, look. -They're quite nice, aren't they? -And they are measures, aren't they? Got a half pint and a pint. You can have the half, I'll have the pint. What could be the best on those, do you think? -They are 40 quid, the two, currently. -Could they be 20 quid? -They couldn't be 20, no. -Dale just said that with no hint of compassion. One to think about, then. Whatever you do, don't let that Anita Manning anywhere near them. And I have noticed a Conway Stewart fountain pen here. And pens are very collectable in today's market. -Could you just do me a favour? -Just hold that a second for me. Hold it, hold it. Thank you very much. Fortunately, he knows it's a dummy. What else has he found? Just a little turned wooden box, isn't it? It looks like rosewood or a hardwood. What I particularly like about it is the price. So we might be having a little lot here. What else could we find? How much are those little shells there? Country-made military chest of drawers. -How much movement is there on price on that? -They would have to be about 70. Maybe 65. -Can you come any lower? -I can't really do any lower on those. -50 quid is my limit on that. I couldn't do it for 50. Could you do £80 for them all? The belt, the two bell tankards and that? -Yes, we could do that. -OK, I need to have a think. Anita has been pawing over the fountain pen. -Dale has certainly been busy today. This wonderful mottled effect, that's what the buyers like. -It is a nice, bright colour. -It is marked at 35. But what I'd like to be paying, really, is round about £20. I mean, I could maybe go to about 25. Could you go to 22? I don't think I can do 22, no. Anita is making herself a little theme there. Meanwhile, it looks like Phil has made a decision. Wow. I think you've been more than fair with me. So these two for 80, yeah? -Yes, we can do that. -have been an absolute gentleman. -You've got some really lovely things. and a 19th-century miniature chest of drawers. Now, how is Anita getting on? name, foundry, any details that you can get. And if we look underneath, we see, "C and F Smith, Birmingham." So I think that's a super item. is this fantastic stylised cat. It has a modernist look about it. But it could be from the 1920s or 1930s. There is no foundry. There is no maker's name. But I think that that is wonderful. This one has got 68 on it. -And this one has got...60. -What one do you think you could give me the best deal on? I mean, that one would be about 60. And the other one would be about 50. This is the one that my heart is going with, and I think I'll go with that. -Is there any other movement on it? -It would have to be that £60. 60. Let's just go for that. Thank you very much. I'm delighted. and pen tray for 20 and a Conway Stewart fountain pen for £23. I'm really happy with all my terrific treasures! pivotal in the history of England and Scotland. Philip's meeting Chris Ferguson to hear more. -So this is Auckland Castle? You're very welcome to join us here. In the 11th century, County Durham became a bloody battleground. when the border between the two countries was ever changing. William granted the Bishop of Durham unprecedented powers. interests in the north and given the title of Prince Bishop. -they had their own mint, they had their own legal system. and he's very much an ecclesiastical figure, isn't he? bishops are wealthy men, they're diplomats, they're military leaders. They're... They're corrupt, some of them. Some of them are quite into gambling, wine, women and song. There were 53 Prince Bishops in total. William Van Mildert, served until 1836. Auckland Castle was the centre of all this power. they were like second most important people in the land. often standing up to the King, rebelling, some of them. And really trying to promote their own authority and power. create a grand palace, fit for the King of the North. building at Westminster or at Windsor. This is a palace complex to compete with royalty. involved in thwarting the Scots' attempts to invade northern England. William Wallace, leaving Scotland in the hands of the King of England. the Scots against the English king who had appointed them. -sort of outflank or outrank the King? a buffer state between the warring kingdoms of England and Scotland. often enjoying the perks of their position. of bishops and you can see they were having a bit of a ball, really. Especially if you look at the 18th century Bishops, they are feasting all the time. what is now the chapel, were built as banqueting halls to entertain in. religious role that continues today. the borders of England and Scotland could now be very different. Anita has also made her way to Bishop Auckland. She's heading for Antiques On The Green, run by Alistair Donaldson. -I see you've got the champagne out! -Well, you know... Just in case. -We can pop one later. Yes, a bit of shopping to do first, though. Now, this is interesting. Boxes of stuff underneath a table. and they haven't been opened yet. And don't worry about getting your hands dirty. There could be treasure in here. And sometimes, where there's muck there's brass. That's the kind of thing that Phil Serrell would love. I wonder if I could give Phil Serrell a hammering with that! Or beat out a profit from it. It's £65, which is quite a lot of money. But it's a good item and it's a fun item. -But my eye was drawn to this big hammer. Can you tell me, Alistair, what on earth this is used for? -To be frank, I don't actually know what it would have been used for. But it's wood, obviously, so you could hit metal, like brass, with it and it wouldn't damage it. Obviously, we've got a massive chunk out there, but that's its history. I would estimate that round about £20. because who knows the price of a big hammer? I've got any option, really, than allowing you to have that for £20. -I think we'll do a deal. -Is that all right? Put your hand there. Thank you. -OK, put it over my shoulder. Yeah, watch out, Mr Serrell. And on that note, it's probably best to call it a day. So, nighty-night! -How did you get on yesterday? -Great. I had a great time. I enjoyed myself a lot. The dealers, I thought they were lovely. -So, how much have you spent? -I don't know. 100-odd quid? You've bought four items for £100?! -Aye. Just be a wee bit careful! -I wouldnae suppose you'd take 50p for it?! all for £123, leaving her just under £120 to spend today. and a 19th century miniature chest of drawers for £80. He still has £106.40 for today's shopping. -I'm not sure that I would buy one of these. -It's a lovely wee thing! despite its Royal Pump Room housing the strongest sulphur well in Europe. It's the jewel of the north, isn't it? I think it's really, really lovely. And well known for so many things. -It's crammed with really good quality antiques shops, isn't it? And I'll tell you something else, you get a great cup of tea in this town. First to shop this morning is Phil. It looks as if there's plenty of lovely things there. -I'm going to go and give it a really good go. -If I can get out of this thing! Antique Market has been trading for over 25 years. -Dealer David Wallace is looking after Phil today. so what's going to appeal to you in here? which I think is just a beautiful, beautiful thing. It is designed by a man called Mycock. I currently have to spend. it's got this little miniature on the cover here. It's priced at £25, but David says he can do it for 18. For me, the golden age of papier mache is from about 1850 to 1880. -Can you do that for 15 quid? -I'll stick my neck out and say yes. You're a gentleman. Go on, I'll take that. Thank you very much indeed. -I'd better give you some money now, hadn't I? So, that's £15 for the 19th century papier mache snuff box. Out on the open road, Anita's travelled to the village of Ripley. the most powerful man in the country in an astounding act of bravery. who are the 26th generation to live here. -Hello! Welcome to Ripley Castle! -Hello. Very nice to meet you. -We call it home and we have for 700 years. We're still paying off the mortgage, so we can't lose it! tumultuous periods of British history. on the other, defending the absolute power of the monarchy. and Cromwell establishing Britain as a republic, with himself as leader. The Inglebys at Ripley Castle were involved from the beginning. Sir William Ingleby and his sister Jane were fierce Royalists. one of the bloodiest battles in English history. Lady Emma's taking Anita to the Knight's Chamber to tell her more. and fight in a battle. in armour, fighting for the King. Yeah. Well, they must have believed truly in their cause. the vast majority of them Royalists. Oliver Cromwell and the Parliamentarians were victorious. but as known Royalists, Cromwell's soldiers were hot on their heels. supposedly in a secret hole at the top of a tower. So, he was cramped in this hole here. -He would literally have been making himself as small as possible in there, fearful of his life. their swords because they were aware that there might be hiding places. -Just enough room for your Bible, your candle and an air hole. The fate of the family was in Jane's hands. Cromwell's army hammered at the gates. enemy and the country's future leader. Jane decides to allow him in and almost negotiate. -why didn't he just chop her head off? onward he has to live with these people for his republic to work. Cromwell insisted on staying the night to recover from battle. His army took to an outbuilding with their Royalist prisoners in tow. Cromwell demanded to sleep inside. while William was hiding in the priest hole upstairs. This bravery earned her the name "Trooper Jane". They would sit down, warm themselves by the fire. She might have offered him refreshments. What do you think Cromwell thought of Trooper Jane? so I think he probably thought, "Do you know, I might just sleep." -could have changed the course of history. being held hostage by a woman, Cromwell left the next morning. shot at the castle on Cromwell's orders. but many people died that night. to Trooper Jane's heroic efforts, the Ingleby family were safe. to £2.5 million, which he did, over several years. but she'll always be remembered for her incredible bravery. Back in Harrogate, Phil has ventured further into antiques territory. The antiques business is a really, really small world. And there are shops there and here that I've done business with for a long, long time. But this guy, picture dealer, he's got some serious stock. who is known for turning up at old farms. paintings from the 18th century to the present day. Hurt. 34. That would hurt as well, £34,000. but I think at £25,000, it might just stretch my budget a little bit. -You wouldn't take a Fiat 500 in part exchange, would you? Not even for you, no. Philip's got just over £100 to spend. but fortunately, Gary has a cellar. -They say "buying blind"... Hell's bells! -What is he up to? These are things that are not for us, really. -That might go, mightn't it? -within the last 50 years? -Yes, that's painted in the last...five years. I've got to pay commission at auction. estimate it at, I'm going to give you 30 quid for it. -Good gentleman. I'd better get you some money out. -Lovely to see you, my friend. south of the town to Crimple Hall Antiques to meet Phil Cannell. -How are you? Nice to meet you. This antiques and vintage showroom has over 50 stalls and cabinets. Hoping that I have a nose for a bargain! I see what you did there, Anita. We have a pair of French Art Nouveau table lamps. They're priced at over £500. for your money for these two fabulous figures. Maybe so, but with just under £120 to spend, it's best you move on. not a Chinese piece, is the quality of the painting. Look at those wonderful peacocks. ..that the foot has been off. And it's been stuck on again. Which is a great shame and it is a 19th century piece. Tempted with the quality, but I'm put off by the damage. -It will all depend on how much I can get it for. -I've picked up this little piece and I've fallen in love with it. I think that it's absolutely lovely. I've gone over it with a fine tooth comb. And this foot has been off. -She's got 75 on it. -you can maybe say to her that it's damaged. -Yeah, yeah. That's absolutely fine. I'd be liking to buy that for £30. See what you can do. -I'll have a word with her. -How did we get on, Phil? -She needs a little bit more. -Oh, I think I've got to go for it. -I'm delighted with that. Can I pay you? So, that's £35 for the Kutani koro and cover. Phil, meanwhile, has made his way west to Skipton. celebrated with their annual Sheep Day. -June, how are you, my love? -OK, hopefully, if there's owt you want, I can sort it out. I'm sure there'll be owt I want in here. There are 30 dealers on over three floors, so best get hunting. Just a sweet little thing. All these are little separate glass canes in there. -And you've got the maker's cane, Whitefriars, there we go. That's a nice quality thing. -What's she got on it? Well, that's clear, at least. A good Georgian bureau used to be six, eight, nine, perhaps £1,000. This one is as rustic as they come. because people are forever losing the keys. So they then have to cut a piece out to get into it. So you've got a pretty horrible patch just there. and is owned by dealer Steve Pickering. I think it's got quite a look. is that at auction is going to make 60 to 90 quid. -Is 50 quid any good to you? -Can you do 55 on it? -I can't give you 70 quid for it. -But I can give you 60 quid. Have a deal with me. So that's £60 for the late Georgian pine and oak Yorkshire bureau. Wow! And that's shopping done. Let's take a gander at their goodies. and a horse painting for £185. and a Japanese koro and cover. Thoughts, please. but in today's market, he probably won't. and you just don't understand them. A £60 bronze cat? I don't understand it! snapping at my heels with his group of items, so who knows? All I need is a bit of luck, and that's good luck, not bad luck! in the East Riding of Yorkshire. -I've got a feeling we're going the wrong direction. Wrong direction. Did you like them? Ha! Does anyone know what he's on about? How are you going to do today? -Well, I kind of think you might have the advantage on me today. Well, we'll soon find out about that. one-day agricultural shows in the country. This looks a really good sale, doesn't it? -Yeah! Are you excited? Oh, another adventure! -Who is going to win this time? and regularly hold sales of antiques, art and furniture. Auctioneer Graham Paddison has assessed our experts' finds. The mallet? I don't quite know what to make of it. Somebody will buy it as a novelty item. and it's collectible, is going to create the most interest. But the bureau, I think, could struggle a bit. Starting with Anita's inkwell and pen tray. -What's it worth? £30 for it. 30 bid at the corner. 30 bid. £30 bid. At 30. Bid seated here. All done and finished, 55. What an incredible start! Anita's almost tripled her money. -I should think you should be. Next up, it's Phil's pair of bell metal tankards. 30. £20 to start then and off we go. 20 bid in the middle here, at 20. £20 bid, at 20. £20 bid, at 20. Seems very cheap to me. But at £20... We're going to sell it. Down it goes. -2! That's the way. 25. At 35. Bid's third row here. Everybody finally down, I think. A decent profit for Phil to start, too. Nearly stopped it! I don't know about getting it going! Back to Anita now, with her rather large hammer. 30 for the wooden mallet here. 30 bid. This side at 30. -I'm getting absolutely trounced here! All done. Finished. Bid's at the front. £90. That's over four times what she paid for it! I think I might go and quietly hang myself somewhere. 40 bid, this corner, bid at 40. At £40, bid at 40. At 40. At 45 at the front. In the corner. All done and finished. Another solid profit for Philip. -I think it's got the right price today in this saleroom. And you made a profit. So I don't want to hear any m-m-moaning. We're sticking with Phil now for his 19th century papier mache snuff box. It's auctioneer Graham's top pick. At £40, the bid standing this side. At £60. All done. Selling. Away it goes. £60. Phil's quadrupled his money on that one. -That was a wee smile playing on your lovely face. Next, it's Anita's Japanese Kutani koro and cover. It's got a damaged foot, but will that put anyone off? 30. Nice quality here. 20 then. 20 bid at the back. At 20. £20. 25. 30. Oh, dear. You stopped quickly. At 30 bid. At £45. 50, fresh bidder. At 50, lady's bid now. Both gentlemen out. 50. At £50 then. All done and finished. Another good profit for Anita. -I think it deserved it. Now it's Phil's priciest purchase, the pine and oak bureau. This could make all the difference to today's victor. 100. £50 to start. Come on. A lot of age to it. A £20 bid. At 20. At 20. At £20. -At £20. Take a fiver if you like. -5, do I see anywhere? At £20 then. All done and finished. Away. Can't do any better than £20. BANGS GAVEL Not the result Phil was after. Do you think that's worth £20? It's firewood, it's worth £20. That's a handcrafted period antique bureau. Back with Anita now. It's her Modernist bronze cat. And auctioneer John Atkinson's taken over the rostrum. 20. £20 bid. 5. 25. Selling away. Going then at £40. That loss gives Phil chance to close the gap. I would never be one to wish ill on anybody. -I've made you very happy. help her stay in the lead? 10. 10, I'm bid, at 10. 15. -I think that's top price for that. -Would you just do me a favour? -Would you just wipe that smile off your face? -30. £30. Bid at 30, bid. At £50, bid of £50. At £50 bid. Oh, it's gone, has it? The internet bidder has disappeared. Oh, Phil! So has everybody else! That's the story of my day! I've even lost my internet bidder! Selling away. Going at £35. So close, but it's still a small profit. In the end, it's OK cos you made a little bit of profit. so has £191.80 to spend next time. cementing her lead with £307.06. All that effort and I think I'm back where I started! Don't worry. It was a bit of a roller-coaster today, wasn't it? -Yeah, you just get in and roller-coaster me out of here. ..things get a bit silly! I think I look like one of those 1960s lamps! Just like that! Like that? Just like that! Not like that, like that! 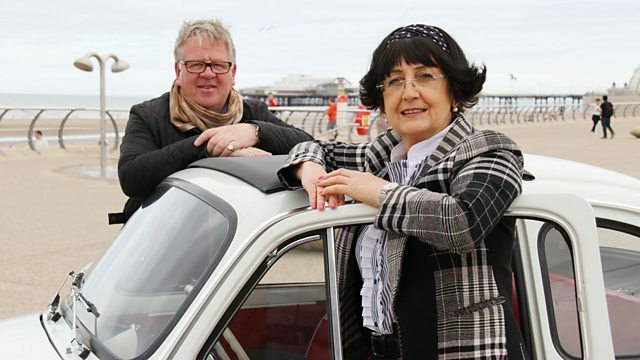 Auctioneers Anita Manning and Philip Serrell continue their trip in their classic Fiat 500. They start from Barnard Castle in County Durham, aiming for auction in Driffield in the East Riding of Yorkshire.